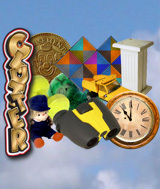 Clean up the clutter in this amazing hidden object game! Take on mini-games and put everything in order again. Progress through countless levels as you dash through each stage and try different modes of play. Randomly created levels and puzzles give you hours upon hours of fun! Can you take on the Clutter? Comments: Love this game. A simple, but great idea. First found Clutter II and loved it. so glad Verizon also included the first Clutter game. Really enjoy the game, the mini games and the tidbits of information and thought provoking messages. A really fun game!